Fair Well Fishery Group held the launching ceremony of two new purse seiner vessels on September 15, 2018. Special BBQ from their own tuna meat, hamburgers, cakes, ice creams and variety of drinks were served. All guests enjoyed the food and welcome to take the photographs in the decorated area, and the printing service was available for guests to receive the pictures immediately. The atmosphere of launching ceremony was just like a carnival; everyone was so cheerful and joyful in that moment. It was raining for a while during the ceremony; even the weather was not that perfect, the number of participant almost broke the thousand numbers. Not only the friends who came from Asia countries, but also from Tuvalu, PNG and Nauru. Especially the Fishery Minister of Tuvalu, Mr. Hon. Puakena Boreham, the Fishing Industry Association Chairman of PNG, Mr. Sylvester Barth Pokajam and the Fishery Minister of Nauru, Mr. Gordon Dageago, their participation has shown the deep friendship between Fair Well Fishery Group and Southern Pacific islands. 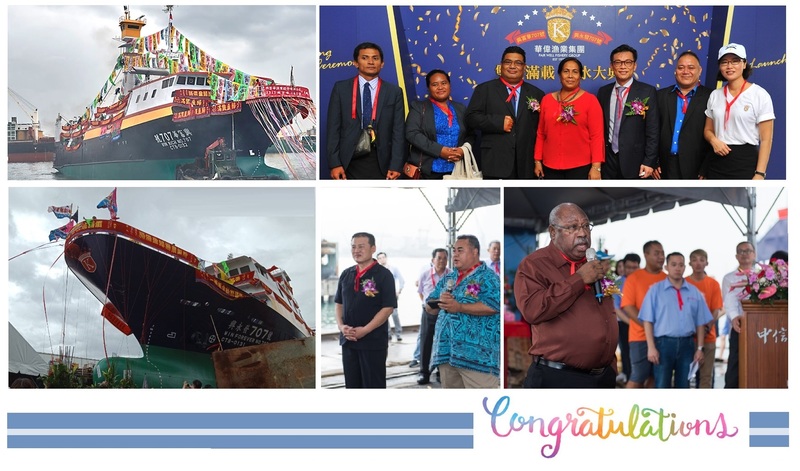 The launching ceremony of Win Rich 707 and Win Forever 707 were so successful under hundred witnesses and received the thousand blessing from all of friends and families with rainbow color fireworks, balloons and clapping.